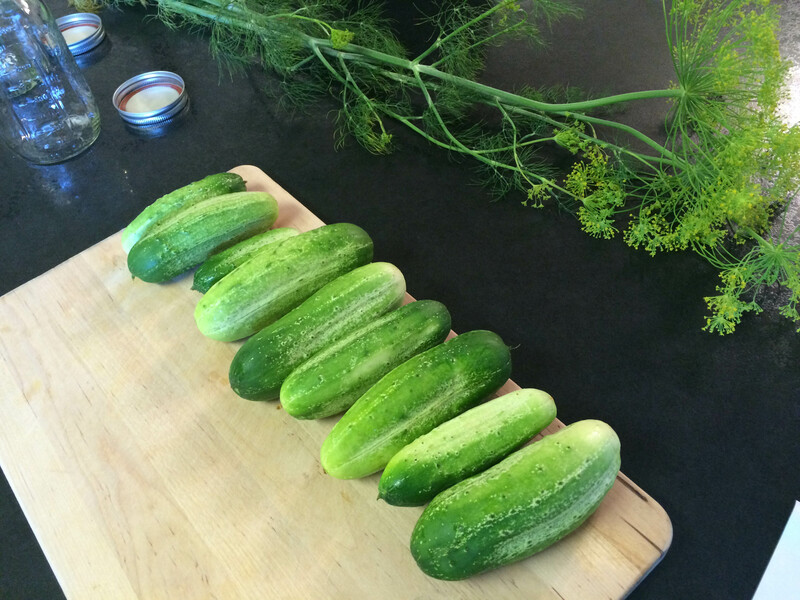 I’ve tried pickling everything I can get my hands on…yet no pickles?! What’s up with that?! 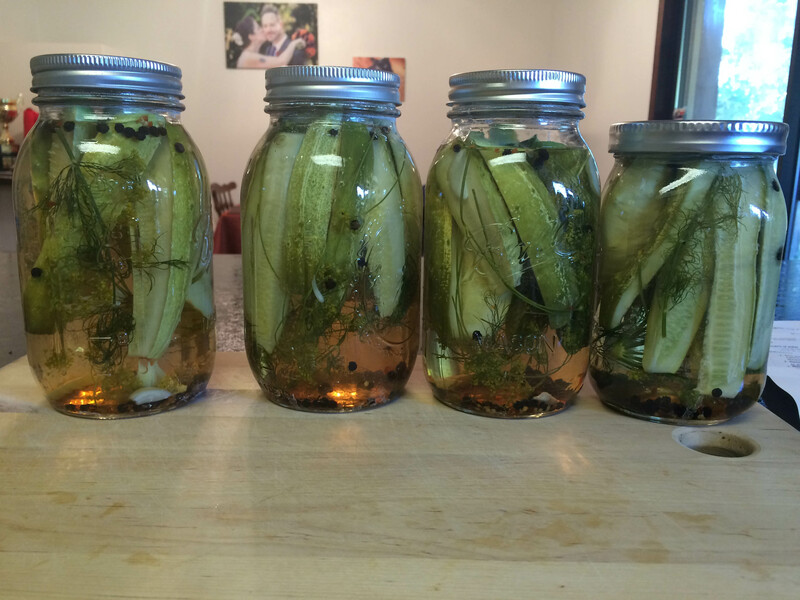 So yeah, I finally tried making my very own pickles! 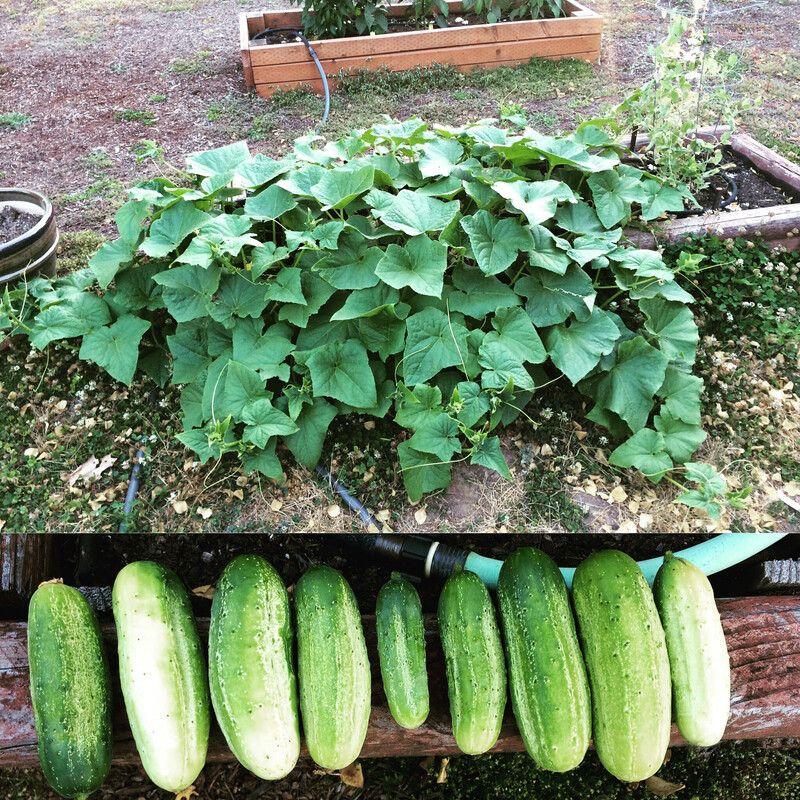 I bought a pickling cucumber plant and waited patiently for something to grow. And then I blinked and the plant had overtaken the entire planter bed. LOL Apparently it’s like zucchini…you only need one plant because it will be prolific. I saw some teeny tiny cucumbers growing and figured it would be about 2 weeks and then they’d be the right size. Well, the heat wave sped that up. They were slightly larger than I had planned on using for my first batch of pickles, but oh well. This will make about 4 quarts of pickles, so you need 4 1 quart jars with lids, or more if they are smaller. Canning jars aren't necessary, but they do need a lid. Wash in hot soapy water and rinse well [or run through the dishwasher]. Measure the water, vinegar and salt into a 3 quart sauce pan and set over high heat - you want the salt to dissolve and the mixture to come to a full boil. Meanwhile, make sure your cucumbers are good and clean. Cut them however you like - the smaller the pieces, the more that will fit in a jar. I like spears, because they are pretty to serve, though if I end up with a lot of odd sized cucumbers, chunks may work better. 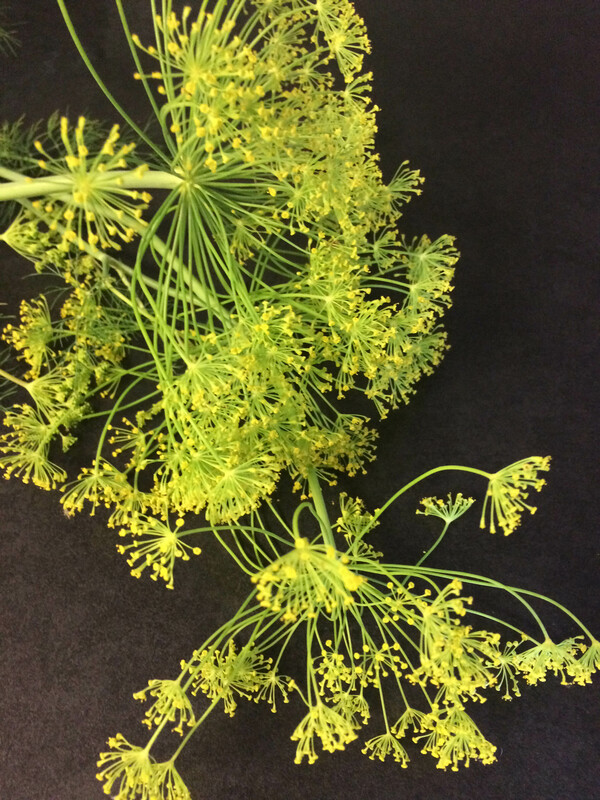 In the bottom of each jar, place 1 large head of dill, or several smaller ones. You can also put in some of the fronds and stems. Then put 1 garlic clove in the bottom. Fill each jar with cucumbers - for spears, it might be easier to lay the jar on its side. You can really cram them in there tightly, but leave a good inch of headspace at the top, so that the brine will be able to cover the pickles. Top the cucumbers in the jars with another clove of garlic, as well as another large head of dill. You can just leave it at that, or for a little more complexity of flavor, add a scant teaspoon of mustard seed, a pinch of red pepper flake and 5 peppercorns to each jar. Leave the jars out in the counter for 2 or 3 days, and then store in the refrigerator for at least two weeks before opening them. I added more red pepper flakes than the recipe called for because I love spice. The recipe was super easy. The one thing I had an issue with was that the liquid wasn’t enough for 4 quart jars. I’m not sure why–maybe I let the liquid mixture boil down too much? I have no idea. But I ended up having to make a second 1/2 batch of the liquid to finish up the pickles. It will be about a week or two and then I can open these babies up and test them out. I’m really excited about them! If this recipe isn’t perfect, I have two other recipes that I want to try and those both are recipes for canning (as opposed to just refrigerator pickles). I will keep you updated on how they turn out. It was a pretty low-key holiday this year. Usually our street goes all out with tons of giant fireworks and a BBQ and everyone does a potluck/drinking fest on our street. It’s always a good time. Sadly, a bunch of neighbors went out of town this year instead so it wasn’t the big affair it usually is. 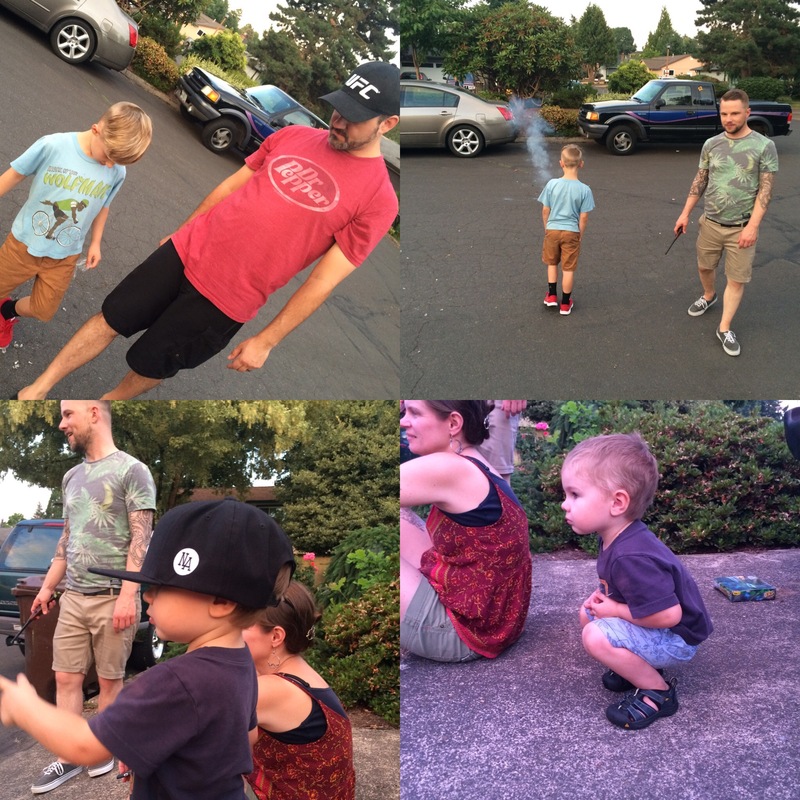 We had our friends Mike and Susanna over for a BBQ and their oldest son brought some fireworks (and I got some of those Pop Its). 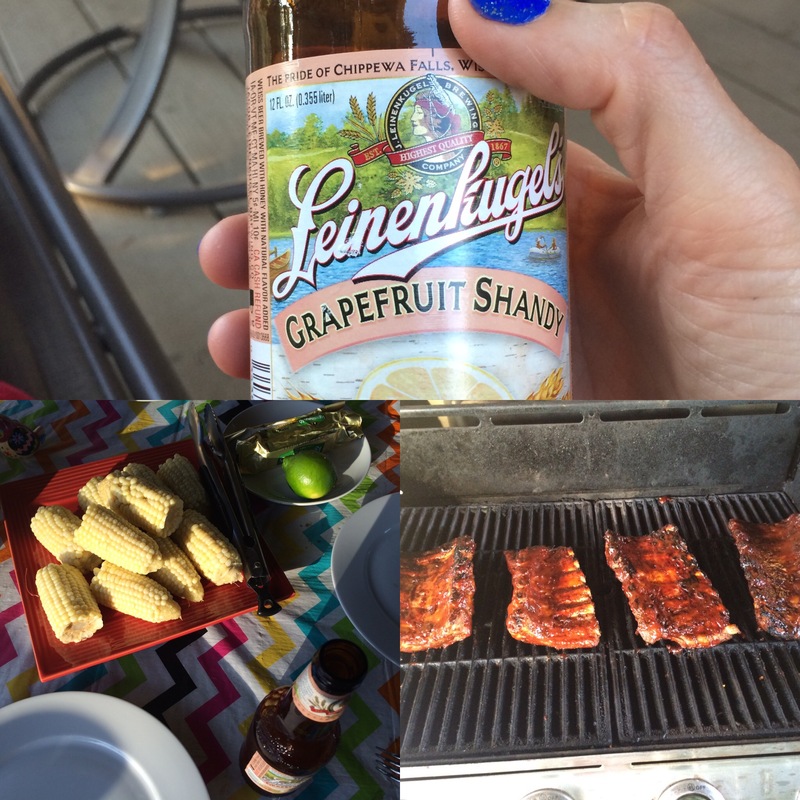 Michael grilled up some ribs for dinner and we did corn on the cob and Baked Beans. I also tried a new (to me) beer! A Grapefruit Shandy. I only bought 2 bottles because I didn’t want to buy a 6 pack just in case I didn’t like it…and of course I loved it, so I wish I’d bought the whole thing. It was very refreshing and light for a very hot summer night. After dinner we went outside and did the fireworks. Their youngest, Rowan, is 2.5 years old and just learning to talk and it’s so adorable! He repeats everything you say and he has a slight lisp when he says the word “yes.” “Do you want to throw some Pop Its?” Answer: “Yesh!” Haha. He’s a little rockstar too. 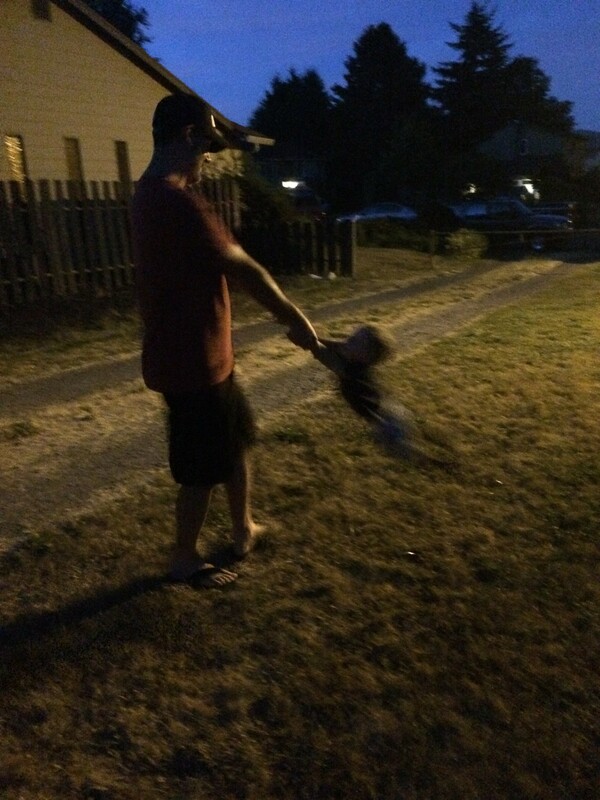 He wasn’t scared at all by the fireworks and seemed fascinated by the whole thing. The teenage neighbor kids were setting off the “real” fireworks once it got dark and we watched those for a bit. Then I went back to the house to be with the animals. They were all freaked out. 🙁 Rowan found Maya (the super scared and skittish cat that hides most of the time) and Maya let him pet her! 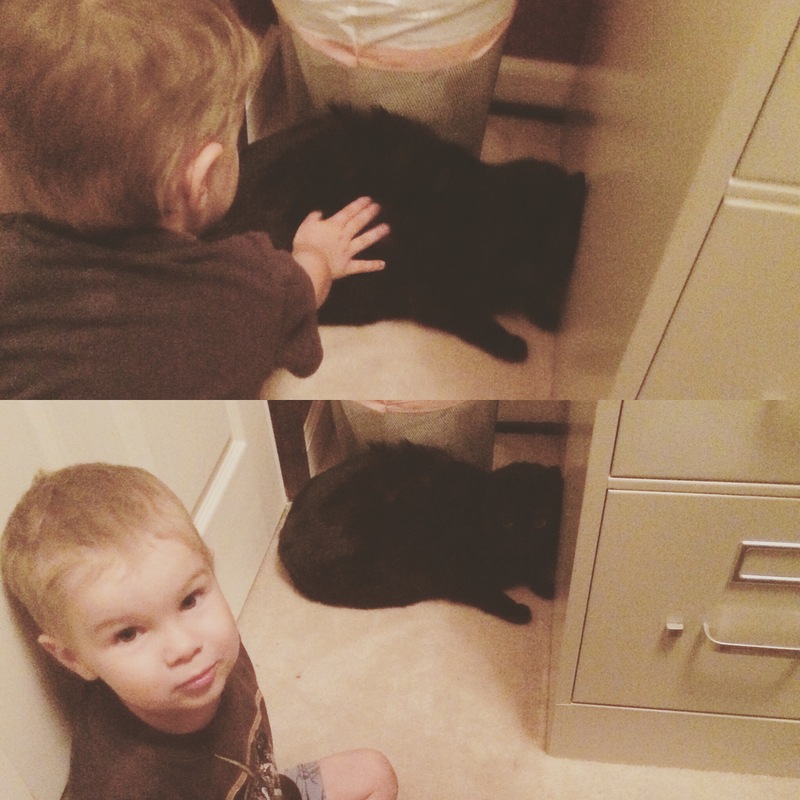 (Which is hilarious because she doesn’t let ME pet her…) Rowan said “I pet the nice kitty” and he did a very good job being gentle with the kitty. It was cute. The next day I went to a birthday party for my friend Debby. It was her 50th! She had the party at K Marie in Milwaukie. It’s a really cool idea for a party. Food and drink and arts and crafts! This time we decorated hat boxes. 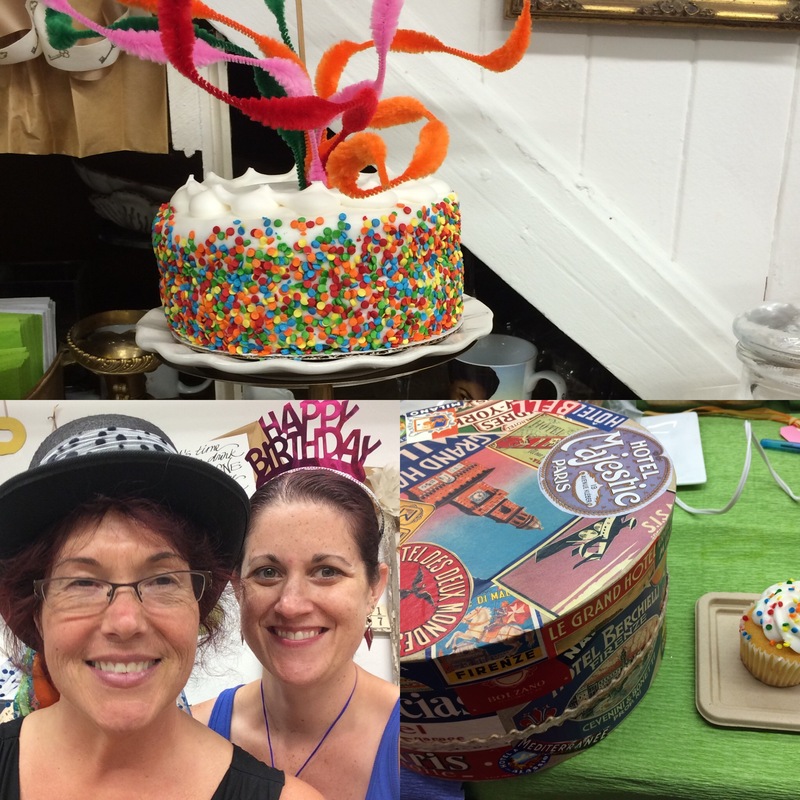 Since Debby went to Italy, Vienna and Paris to celebrate her 50th birthday our hat boxes were European themed! It was so much and everyone’s hat box looked a little bit different even though we all used the same stuff. There was artichoke dip with bread and crackers, a refreshing fruit and mint salad and of course cupcakes! It was a busy busy busy weekend but so good! And I was so happy to see so many friends! You know, I adore cucumbers, but I hate pickles. Isn’t that weird? I do love me some pickled jalapenos, though! Lori recently posted..Flat tires and lasagna roll ups! Oooh I will have to look for those! Oh we will be pickling jalapenos shortly! Our summer has been so unusually hot so early that our garden is going nuts. Ive never ever eaten a pickle. Really?! How is that possible! ?